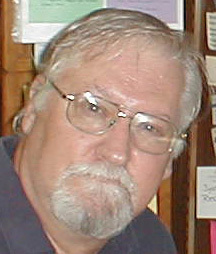 Born and raised in the San Luis Valley, I graduated from Monte Vista High School in 1966, attended Adams State College (now University) from 1966 to 1970, earning a double major in speech and education with a minor in journalism. I was married in 1967 to Jean Jones. Our first son, John, was born in 1968. After completing my student teaching in the fall of 1969 and with the Draft Board breathing down my neck, I took a two-year enlistment in the army. Trained as a military journalist, I served in the public information offices at Fort Eustis, Virginia, and at VII Corps Headquarters outside Stuttgart, Germany. Back in Denver, our second son, Aaron, was born in 1972. I had already been dabbling in fiction writing and after completing a master’s degree at the University of Denver in 1978, I became more dedicated to my writing. In 1982, I wrote MOONSLASHER, which I sold to Critic’s Choice a few years later. I was the interim director of public relations at DU when I sold it and my second novel, THE OCCULT MADONNA. Changing jobs, I went to work for the Colorado Community College System (CCCS) as first a staff writer and then manager of communications. Leisure Books bought ON WINGS OF LEATHER in the mid-90s and published it as THE DEVOURING, named one of the 10 best horror novels of the year by Science Fiction Chronicles. I retired from CCCS early in 2008. Since then I published a daily online “newspaper” for higher education that was popular throughout the state, but became a victim of the recession and folded in 2010. For a year, I wrote a blog, “It’s the End of the World…Not” and served a two-year stint as president of the Colorado Authors’ League. Along the way I judged first novels for the Horror Writers Association and entrenched myself in e-publishing.